Seiko presents a watch that is designed for underwater performance with an incredible 200m water resistance. Luminescent indices allow for enhanced readability and features a bezel to track 60 seconds with ease, with rose gold plating for added luxury to a brilliantly functional timepiece. 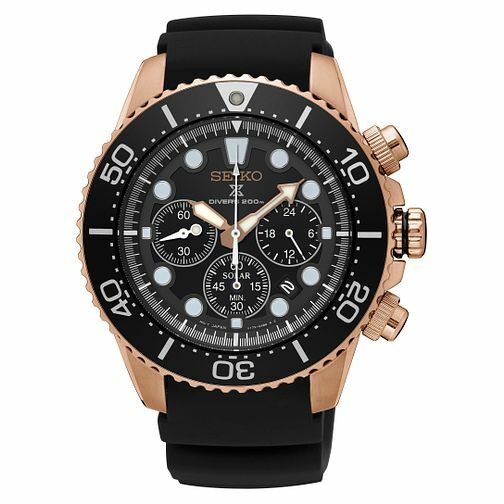 Seiko Prospex Men's Rose Gold Plated Chronograph Watch is rated 3.7 out of 5 by 3. Rated 4 out of 5 by Anonymous from Very nice, practical and handsome watch High quality, excellent features — Chrono; swim proof; solar and accurate, no need for battery replacement or winding; extremely accurate. Very nice look in rose gold plating; screw-down crown and chronograph push pieces. Proper sizing — substantial heft without dominating the wrist.